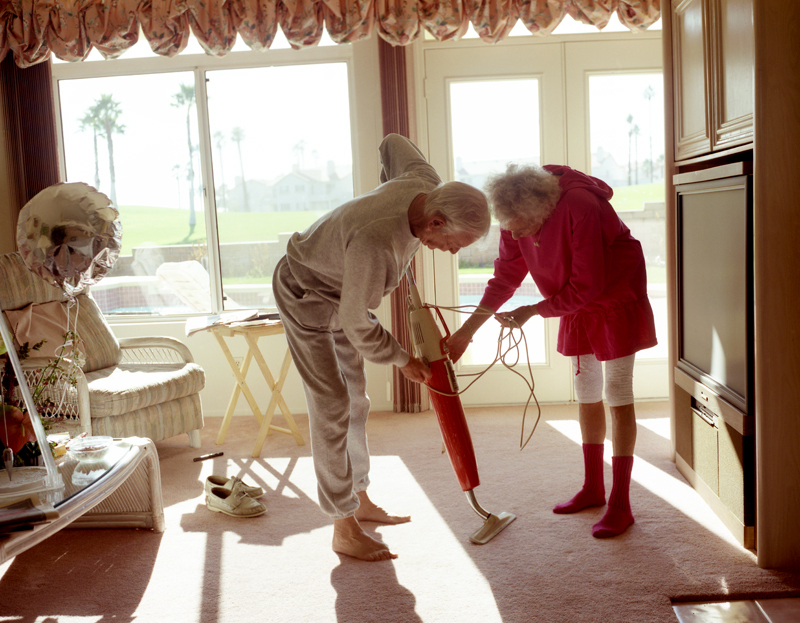 Larry Sultan, Fixing the Vacuum, 1991. Courtesy The Estate of Larry Sultan and Casemore Kirkeby. Jean easily matched his smooth glitz, but favored pastel notes in her outfit, with loud bling coming from cocktail rings, a rhinestoned watch, fringed metallic purse, and pendants on a long gold chain that hung over her pink satin Chanel sweatshirt. I immediately sensed a gulf between the two of us. Nothing I owned approached the word “outfit,” and I wondered how long it would take before she realized I wasn’t the daughter-in-law she was hoping for: Finally, a girl in their family of all boys, a best gal pal, a let’s-go-get-our-nails-done, shop-’til-you-drop, sit-out-in-the-sun-and-look-at-fashion-magazines kind of girl. She hadn’t even met me yet, and I worried I’d already disappointed her. But, it turned out they were both warm, embracing, and eager to meet me. Then it was just as clear they were eager to get back to the nickel slots (for Jean) and the craps table (for Irv). Larry hadn’t told me much about his dad, but in that first brief encounter, I detected an every-man-for-himself vibe — or maybe even a let’s-see-if-you-pass-the-test sort of vibe. Throughout his life, Larry was confronted with his father’s machismo. This is the relationship he originally proposed Pictures from Home would explore in his Guggenheim application. Judgment and challenge emanated from Irv with the strength of a lighthouse beacon. When the fierce beam swung in your direction you were immobilized by its harsh and blinding gaze. Then, it swung away and with equal force directed its attention out to sea, as if you didn’t warrant the slightest glance. It was totally sink or swim with him. The hard part was, you never knew when you would be thrown into the deep end or just left alone — qualities that I’m sure came in handy growing up in an orphanage and rising through the ranks, from door-to-door salesman to VP of Sales at the Schick Safety Razor Company. Jean, on the other hand, could be counted upon to give you her full, if wildly misinformed, attention. Both of their hearts were big and bold and full of torrents of foul language and punishing silences. Yet, it was their total devotion and love for Larry that enabled them to fully participate as both subject of and essential critic for the ten years it took for Larry to make Pictures from Home. Larry writes that he worried about his parents not getting along when they decided to move from the San Fernando Valley to Palm Desert. It would be so hot they’d be stuck inside watching daytime TV or arguing about grocery coupons left behind. The new house would become a tinder box full of the cumulative resentments of a fifty-year marriage to someone you loved, but spent your time watching — waiting to tally all the reasons why they drove you nuts. That dream house on the golf course would become a sand trap for golf-cart-road-raging eighty-year-olds. So here is that picture of despair. Or, here is that picture about memory and reflection. Empty Pool. It seems like the natural place to end Pictures from Home. But Larry’s text about his parents’ unexpected embrace of desert life pushes the book forward from here. Larry Sultan, Empty Pool, 1991. Courtesy The Estate of Larry Sultan and Casemore Kirkeby. Fixing the Vacuum was shot in Irv and Jean’s new Palm Desert home. Life is good. It could even be the title of this play, this construction of a stage, set for a real-life drama: “What to do about the broken vacuum?” You can even see just outside the windows that the Empty Pool is now Full. In a gesture of empathy and good will, Irv is taking a look at the vacuum. I say gesture because it’s quite clear that no one knows how to fix the vacuum. What’s happening here is that, really, Larry is taking a picture of a question: How on earth do two people maintain a life together? What story do they tell themselves, and what stories do they tell others about this life? What keeps it from completely breaking? What sound does it make when it’s working? Asking big questions by examining the mysteries of daily life was how Larry tended to approach picture making; he was always hoping to capture something just off stage, a “strange creature” that would be revealed only after the picture was printed. He was much less interested in answering than he was in asking. What is uncovered here is that, for now, Irv is in a helpful mood, filled with the good will that comes from finding the good life in his eighties. He barely drives it, but he even bought a sports car. He’s a bit a softer around the edges, though still a player, and still fully capable of giving you that infamous, withering “look.” And he’ll still turn on a dime. Maybe even moments after Larry took this picture, he erupted and blamed Jean for saying the vacuum was broken when it was just unplugged. For now, though, it’s peaceful in the cactus garden. There is one mystery in this picture that has never been uncovered… until now. This is also a photo of Jean’s devoted love and generosity. Her daughter-in-law tried very hard to buy her an exercise outfit she thought would be the cat’s meow and presented it to Jean on her birthday. This photo was taken on that occasion. And just like a parent enthusiastically accepting her kid’s handmade and misshapen clay pot, she graciously donned the ill-fitting outfit without a shred of hesitation or concern for her appearance, and allowed Larry to take her picture wearing it. When Larry used to show this picture, he joked that once they moved to the desert, his mother began dressing to match the appliances. But I would like to take this opportunity to set the record straight. The real truth is, her outfit displays her generosity and her love. She absolutely knew how ridiculous it looked. I never saw her wear it ever again. “Fixing the Vacuum” was adapted from a talk given at “Study Hall: 10×4 on Larry Sultan,” May 4th, 2017, at SFMOMA. what a wonderful, insightful essay. thank you Kelly.